On a December morning in 1970, the King of Rock ’n’ Roll showed up on the lawn of the White House to request a meeting with the most powerful man in the world, President Richard Nixon. Starring Academy Award-nominee Michael Shannon as Presley and two-time Academy Award-winner Kevin Spacey as Nixon, Elvis & Nixon tells the untold story behind this revealing yet humorous moment in the Oval Office forever immortalized in the most requested photograph in the National Archives. Art Shrian – Congratulations on your wonderful film. It’s hilarious, and also very entertaining and compelling. You have such a brilliant cast, but these are not exactly obvious choice. So how did you come up with this cast? 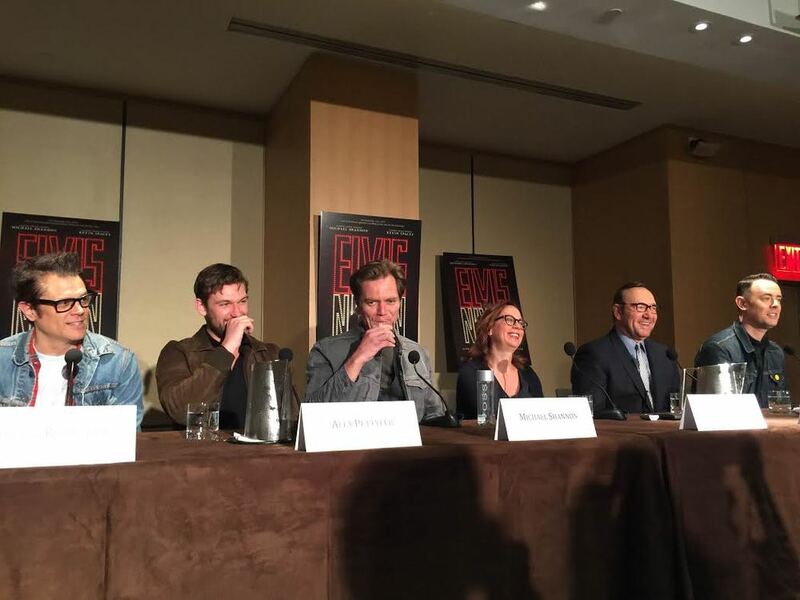 Liza Johnson – When I read the script, I immediately decided that this would be with Michael Shannon. Honestly when someone told me about it, I didn’t know how this will work. Just because, I have worked with Mike before, I know he can do anything. But it wasn’t obvious thing to me. But when I read the script, then I was like, hell yeah, that’s a good idea. Because the story had this kind of curious and exciting, and even coocky tonal variation, where it has this real depth of character for Elvis, while he’s on his journey. And at the same time, it has this real absurdist quality, because of the comedy of the situation, or because of the juxtaposition that happens when he’s with Nixon. And I thought, that’s exactly Michael Shannon, because he is the person that is the most comfortable with that entire range. And then, I think, because he’s well known to be a mad talent, that was very helpful in attracting Kevin to the project. Because I think, that when you’re at that level that those guys are at, it’s great to get an opportunity to sort of play against someone, who’s at the same level. 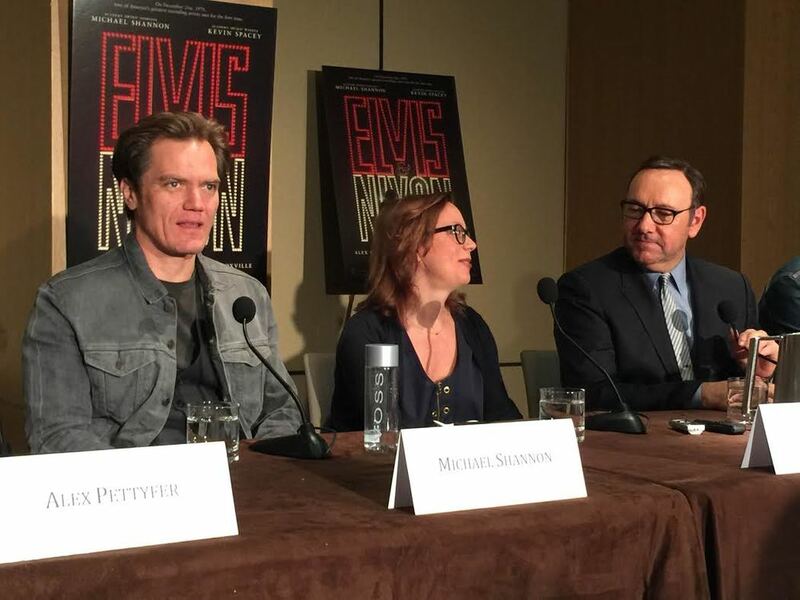 Kevin has said to me himself that Mike being Elvis was one of the thing that attracted him to the project. And once we had them, many other actors took same position. So we were able to get Alex to play Jerry Shilling, who was actually recommended by Jerry himself. Johnny is from Tennessee, knows about Elvis a lot. I think partly he was attracted to Elvis of it all. And he has worked with Mike before. And it was so great that we could get Colin Hanks and Even Peters to be the Nixon boys. And once we had that, this snowball kept coming. Some of Mike’s Chicago people, like Tracey Letts for his entire career. The first time Mike was ever on stage, Tracey Letts played his dad. That was one of the most moving part of our shoot, for me to see them together. To see what it means for to let your work grow together, over really your entire lifetime. So at certain point it kind of snowballed, where all these incredible people Kamal Angela Bolden, who plays the guy with medallion in grocery, Sky Ferrera, Ashley Benson, Annette O’reily. Once we had this snowball going, it kind of avalanched. A – The cast may not look like characters, but they do an amazing job. As the director, what was your approach to that? L – Yes, we decided that likeness was not very important thing. And it was quite different with Elvis, with any other figure, because he’s the most known face. 1955 Elvis is most famous Elvis ever. And even Elvis in 1970 doesn’t look like "The Elvis". So how do you do that as an actor, how do you make yourself look like Elvis. Because no one can! I don’t think even Elvis can play Elvis at certain point, because the iconic 1955 Elvis is so stamped at everyone’s brain. A – And the film also make a wonderful joke of that. L – That’s Joey, the writer, and his team. They do great job on this. The writers of the film are just wonderful. The entire team is just amazing. A – This is a historical film. So you must have done your research on subject. What was the most exciting and most challenging aspect of the research? L – There’s quite a lot that’s known. There’s the picture in National Archive, there’s the letter that Elvis wrote. One thing I like about the screenplay is, it’s almost like an adapted screenplay, adapted from that letter. There are other docs that exist, like the memo that they’re holding. There’s less than it would have been couple months later, when Nixon started taping every conversation. But frankly, it might be more boring. That’s where dramatic interpretation adds something. Historical documentation is compelling because its true, and dramatic interpretation is compelling because it can offer you some emotional truth that may or may not exist in the documents. We also had Jerry Shilling with us to consult, and we agreed that it was important to find emotional truth. If you read his book, there’s lot of details, intimate information both about him and Elvis, I highly recommend it, it’s a great book. The great thing I learnt, he remained great friend with Elvis by maintaining some measures of distance at crucial moments. Elvis did really send the box of business cards to Jerry, but it was after a little while of this trip. But some of that time frame is little bit compressed. Because if you go by the clock, the story of the friendship isn’t the same. Since that friendship was real, and since it did go this way, is it more true or less true by fitting that into the story? I think it enhances it, and I was ready to stand by that. A – You're a New Yorker. What’s your most favorite thing about New York, and what you hate the most? L – The most important thing about New York is the community of people that I live and work with. It’s really like a very nice world of artists and intellectuals. That’s’ what the core of the city is for me, the access of people of common interest, even when they are very eccentric. I will say, that whole money thing is bumming me out a little bit. There’s a new building right outside my window, blocking my view, and it’s going to be bought by some other people, like Russian business, or maybe a bank or financial institution, and that’s bumming me out. But as long as my community of people hold up, I’m game!